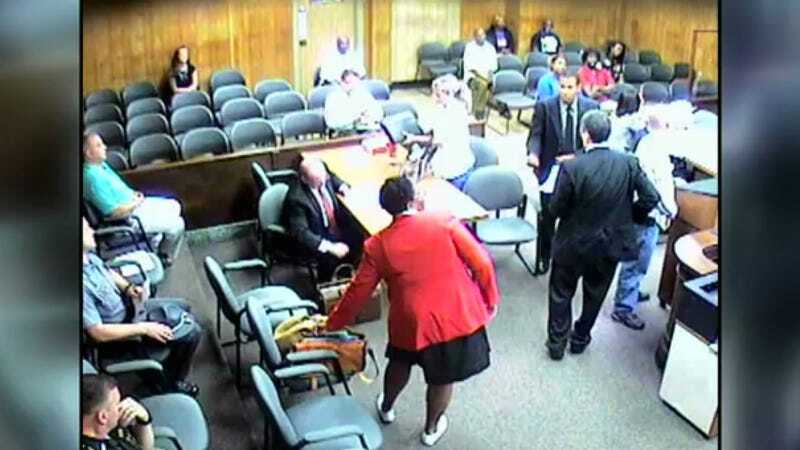 Last week, Ohio attorney Andrea Burton was given five days in jail for contempt of court by Youngstown Municipal Court Judge Robert Milich when she refused to remove her “Black Lives Matter” pin. But he says it was an objective decision. “A judge doesn’t support either side,” he said. “A judge is objective and tries to make sure everyone has an opportunity to have a fair hearing, and it was a situation where it was just in violation of the law,” he said. Unfortunately, it looks like Judge Milich absolutely has the right to insist that attorney’s in his courtroom dress to his standards. A judge may prohibit symbolic political expression in courtrooms, even ones quietly attached to a lapel. That really depends on the context, I suppose. I’d find a lawyer in fan gear for The Eagles extremely distracting in a court room.